First of all, thank you for choosing WordPress.com — you’ve come to the right place! Blogging is our specialty, and we have a treasure trove of resources to help you build your blog and make it successful. We’ll be with you through the whole journey, from figuring out what to blog about, through signup and set up, to ongoing inspiration and tips. Let’s get started! A blog is built around content, so it’s important to take some time and think about what you want to blog about. The possibilities are endless, but writing down the things that you enjoy is often a good first step. Excitement is infectious and being passionate about the topic will make blogging much easier, and more fun! 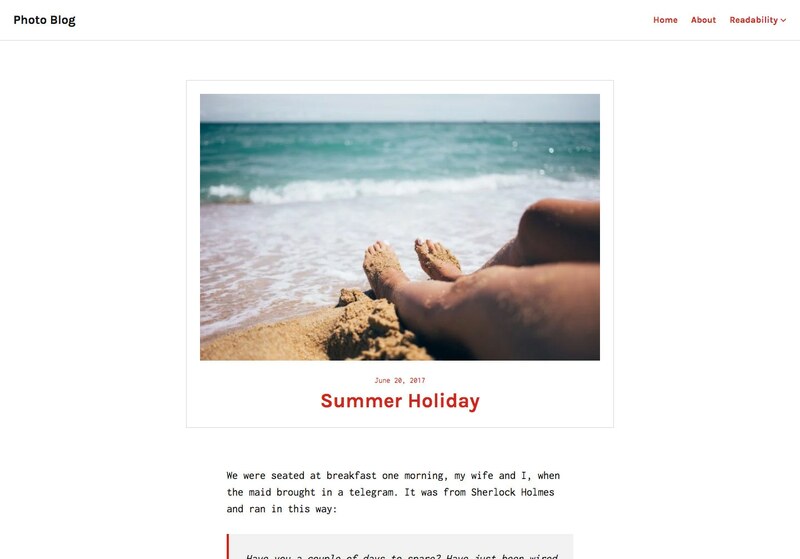 Most importantly though, don’t put off starting a blog until you’re 100% happy with your chosen subject. It’s bound to evolve and change over time anyway, so don’t let perfection get in the way. Blogging University: e-mail courses on a variety of blogging-related topics. “Blogging Fundamentals” is a great place to start, and if you’re passionate about photography, we highly recommend the “Developing your Eye” two-part course. The Daily Post: a community space where you can join in weekly photo challenges, share your new posts, ask questions, and get feedback. Subscribe in your Reader so you never miss an opportunity. In this step-by-step guide, we’ll show you how to set up Photo Blog. We’re going to use the Customizer to configure your site’s look and feel. To access it, click on My Site in the top-left corner; then in the Personalize section, click the Customize button (it’s next to “Themes”). Going forward we’ll use Customize → X format to point to a specific section within the Customizer. Learn more about the Customizer here. Whenever you make changes that you want to keep, click on the blue “Publish” button, to the right of the “X” button. When you’re ready to exit the Customizer, click the “X” in the top left corner. Don’t worry, we’ll remind you to save your progress as you go. Let’s get started! Open My Sites → Customize and click on the Site Identity section. In the section that opens out, click the “Add Logo” button to open the Media Manager. Click “Set as logo” — and you’ll see your logo appear in the preview. Adjust the size using the sliding bar labeled Logo Size. If your logo includes your site’s name or you only want to display your logo in the header, hide the Site Title and Tagline by unchecking Display Site Title and Tagline. Click the “Publish” button on top to save your changes. Your logo will appear above your site’s title. The maximum display dimensions for the logo are 624 pixels by 624 pixels. A navigation menu helps visitors find the information they’re looking for. The first step is to create a menu, following these instructions. Once your menu has been created, you can choose where to put it. Assign the menu you’ve created to the Header Menu Location. Click the “Save and Publish” button on top to save your changes. 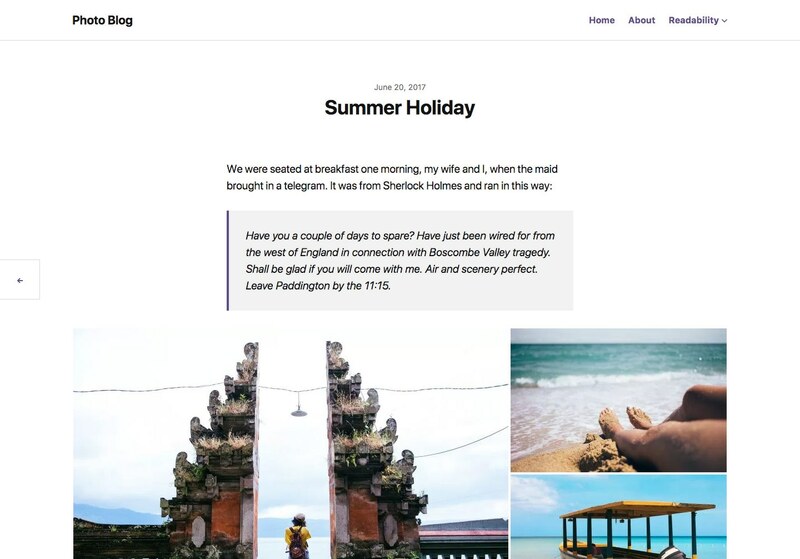 With Photo Blog, you have the option to display links to your social media profiles at the bottom of your website. To display them, you’ll need to set up a Social Links Menu. Linking to each of your social-media profiles in your social menu will automatically display its icon. See which social-media icons are supported. Head to Customize → Style Packs. Click on the images to instantly preview how it will look on your site. Once you’re happy with your selection, click the “Publish” button on top to save your changes. Grid: a variation of the default layout, with white borders added around each image to give them extra breathing space. Each image will display as a square. 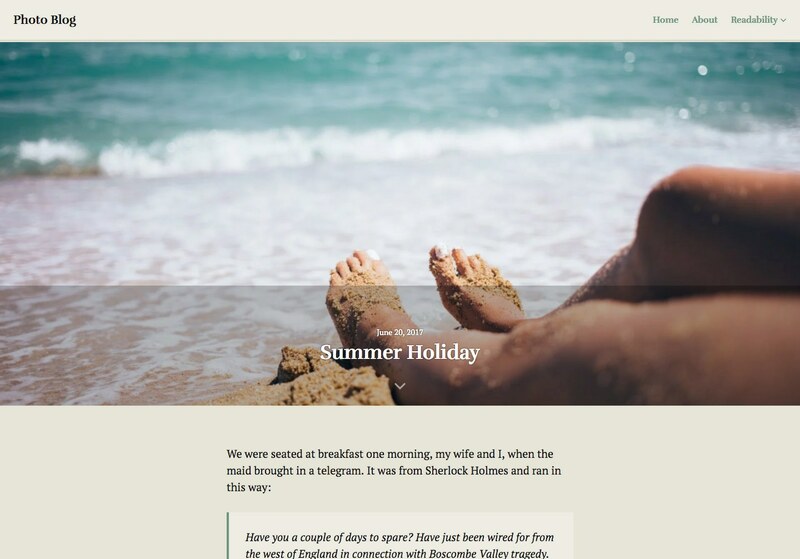 Masonry: a layout that adapts itself to your content, preserving the proportions of your photos. Give it a try if you have a mixture of square, portrait, and landscape images. Head to Customize → Layout. With twenty-six different image filters, Photo Blog allows you to add a special effect to your featured images. It’s a simple way to give tweak a photo’s look — without photo-editing software! The filters are applied to all Featured Images on the homepage and the Featured Images on single posts/page. Head to Customize → Featured Images Filter. Click on the images to apply a filter and instantly preview how it will look on your site. Photo Blog offers three optional widget areas, located just above the footer, which you can configure via Customize → Widgets. 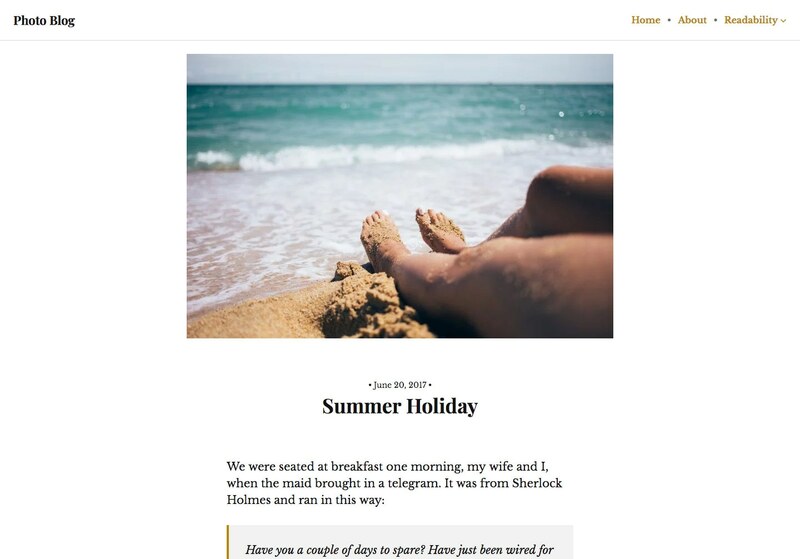 Use them to add extra features to all the pages on your site: a form to follow your blog, a list of your recent posts, even embededd content from your social media accounts, like Instagram and Twitter.